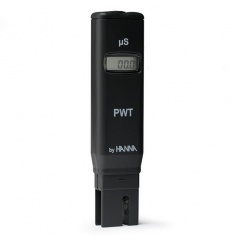 The HI98308 Pure Water tester is a rugged and reliable pocket-sized tester that offers quick and accurate readings. The HI98308 Pure Water tester features graphite electrodes to reduce polarization effects and an exposed temperature probe for fast response when compensating for temperature changes. Manual calibration is performed to a single point. The HI98308 features an amperometric graphite electrode that provides better repeatability in measurements since they do not oxidize. An amperometric measurement of EC is based on Ohm’s Law, I = V/R, where R depends on the distance between two pins and their surface. Oxidation changes both the distance and surface, which will affect accuracy. The non-oxidizing graphite pins are able to provide an optimal surface for accurate, dependable results. When calibration is needed, simply submerge the electrode tip into calibration solution and adjust the trimmer on the side of the tester. The HI98308 uses a conductometric measurement to determine the purity of water. The HI98308 Pure Water Test (PWT) enables users to check the purity of distilled or demineralized water in laboratory or industrial environments. PWT is suited for fields such as printed circuit board washing, laundry, steam cleaning, checking car battery water and all areas where distilled, demineralized or pure water is used. This tester is housed in durable casing that provides excellent protection against harsh industrial environments. Electrolytic conductivity, abbreviated as EC, is a measurement made in which electrical charges on atomic or larger sized particles in a medium are moved under the influence of a potential difference. EC is a measure of concentration, however, it is non-specic for ion type. An ion is a charged particle present in the solution that contributes to the current flow. Ions are formed when a salt such as sodium chloride is dissolved in water to form particles having electrical charges. Sodium chloride, separates into Na+ and Cl-. This is a simplified definition as the measurement is affected by many things such as the type of ionic compound(s) dissolved in the water; the ions mobility, the solution viscosity, temperature as well as concentration. Electrical conductance, the ability of a substance to conduct an electrical current is the reciprocal of electrical resistance. “Conductance” and “Resistance” depend on the geometrical dimensions of the substance being measured. Conductivity and resistivity are “normalized” terms that are used to denote a bulk intrinsic property of a substance. This is the measurement a standardized EC probe on a Conductivity or resistivity meter provides. Conductivity measurements can be used to provide additional industry specific measurements; TDS, Salinity and USP compliant conductivity. 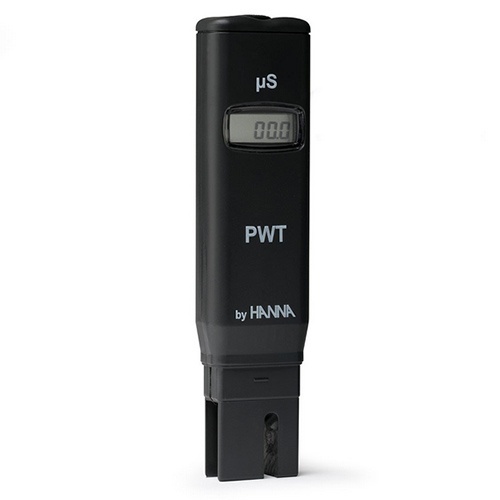 Many of Hanna’s meters provide these measurements also.